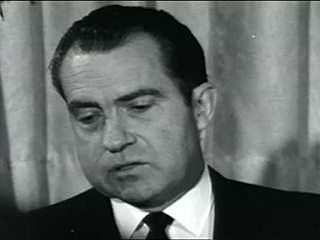 Chicago: “American Experience; Nixon; Nixon: Los Angeles, news conference, 1965,” 02/12/1965, WGBH Media Library & Archives, accessed April 21, 2019, http://openvault.wgbh.org/catalog/V_BA9E5A2A03084214A283CC63C0E81BD4. MLA: “American Experience; Nixon; Nixon: Los Angeles, news conference, 1965.” 02/12/1965. WGBH Media Library & Archives. Web. April 21, 2019. <http://openvault.wgbh.org/catalog/V_BA9E5A2A03084214A283CC63C0E81BD4>.